In the Fool’s journey through the Major Arcana, Temperance (XIV) represents the lesson that real change takes time, and as such one’s ability to exercise patience and self-control are infinite virtues. The Temperance card suggests moderation, balance, and frugality, warning that extremity in any situation is to be avoided. Drawing it implies that you know who you are, what you want to achieve, and how you plan on realizing your goals. It indicates that you’ve found yourself and are at peace with the way your life is unfolding. The essence of Temperance is balance. In the Rider-Waite deck, the Temperance card shows a winged angel pouring liquid from one cup to another, its gender perhaps not immediately obvious but decidedly female. The two cups she holds in such a way that she can mix or interchange the liquids within them, representing the super and subconscious minds, union and infinity. She has a golden halo around her head and at the end of the path she is on, there is another. These halos represent spiritual enlightenment, indicating that one has to follow their current path to conclusion if one is to receive the light. She has one foot on land, representing the material world, while the other is dipped in a pool of water lying before her, a representation of the subconscious. She is perfectly balanced between both realms, patiently performing her eternal task. On her robe is a square with a triangle inscribed inside of it, suggestive of a tangible earth in union with the Holy Trinity. As a person, Temperance represents someone who has a patient, balanced approach to life and understands the value of compromise. They could be a healer or have other psychic abilities and are able to combine different aspects of any given situation to create something new and fresh. Because of their natural gift for diplomacy, they tend to be excellent communicators and mediators who bring out the best in people, and as such are often employed in management positions. Temperance people understand that everything unfolds as it’s meant to, that there is never any need to hurry things along. In an upright position drawing Temperance signifies that when the going gets tough, you are someone who is able to remain calm and rational, who won’t let stress get the better of you. Rather, you are patient and prepared to simply go with the flow. You are blessed with the ability to see the entirety of a situation clearly, allowing you to enjoy significant progress in those areas of life you choose to seek out and explore. 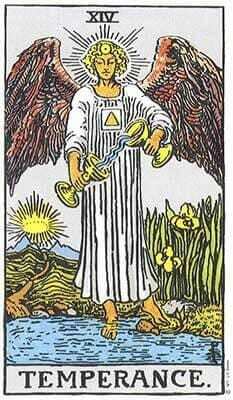 If you are in a relationship, you couldn’t hope to draw a better card than Temperance. It signifies the perfect balance of love, commitment, and mutual respect among soulmates. If you have had relationship difficulties recently, Temperance indicates you and your partner will resolve any problems coming in between you harmoniously and that your union is on solid ground. If you’re single, Temperance serves as an indication that you will learn to balance other areas of your life so as to make room for a new, special lover to come into your world and swoop you off your feet. This is the perfect time to set new career goals as you have the patience and persistence to achieve all which you desire. While you can rest assured that your hard work and dedication has been duly noted by your superiors, if you’re hoping for a promotion you must remember to be patient and not instinctively jump at the first opportunity offered to you. There may well be something even better just around the corner. Your finances are finally starting to stabilize, and if you’ve been in debt, you won’t be for much longer. This doesn’t mean that you’re about to win the lottery or receive a billion dollar inheritance, only that you’ll soon be more comfortable financially than you typically have been. Nevertheless, you still need to reevaluate your relationship to money in order to realize and accept that you need to be more frugal. Moderation is the name of the game here. If you have any bad habits that could compromise your health, this is a good time to try and get them under control. Maybe you need to exercise more frequently, quit smoking tobacco, or eat a more balanced diet. Addressing these areas will provide you with the boost you need to feel healthy and energetic again. Temperance reversed indicates imbalance and overindulgence, a warning that you are engaging in reckless behavior that will come back to harm you. Be it drugs, alcohol, gambling, overeating, impulsive shopping, or any other similarly negative behavior, Temperance is a sign that you’ve gotten too far away from yourself and need to step back and realign with your core inner being. If you’re in a relationship, drawing Temperance reversed indicates there have been numerous recent conflicts caused by an imbalance in your partnership. One of you feels as though the love you’re giving is not being reciprocated. You need to find your inner balance so you can better deal with your relationship problems. Once you do you will be far better equipped to make the right decisions and find solutions to the issues you face. If you’re single, you’ve been showing your hand too soon when it comes to your romantic interests and need to start playing things a little more coy. So step it back a few notches — you don’t want to appear desperate, do you? This is not the time for you to go it alone in any professional capacity. Regardless of your actual situation, you need to be looked upon as a team player by your professional superiors, even if you work independently. Regardless of how dismal your career options may seem right now, trust that your accomplishments have not been overlooked and that you’ll eventually receive the recognition you deserve. Temperance reversed indicates that your finances are well-balanced, that you have the right amount of money coming in and going out every month. However, you could certainly stand to be a little more flush, so don’t be shy about going out and chasing any promising financial opportunities that come your way. If you are proactive about it, more funds will find their way into your bank account. Even reversed, Temperance reminds us that on the health front it’s still all about balance and moderation. Take good care of yourself, exercise, get enough rest, eat well, do all the things you know you need to do in order to stay healthy. If you are experiencing health issues right now, it’s because you are out of balance in these areas. In the past position, Temperance indicates that your ability to work harmoniously with others while balancing the material and spiritual elements in your life has had a profound affect on your life to date. This will be ongoing. 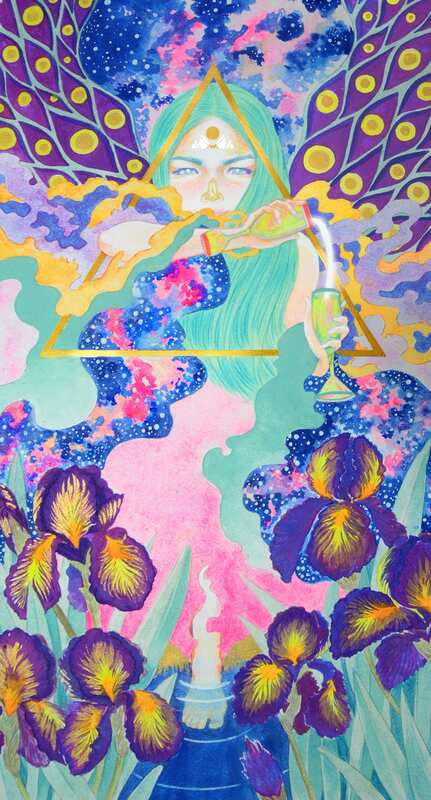 In the present position, Temperance means that something you’ve long yearned for — be it wealth, romance, a new car or something entirely different — is about to come to fruition. In the future position, Temperance warns you that in order to resolve any current conflicts and move forward in life, you need to stay in control of your life by exercising restraint, balance, and moderation. Temperance is a highly spiritual card. In any combination, it beckons you to act with wisdom and forethought. Some kind of international excitement appears to be in store for you when you have drawn this card combination. There is no indication of danger, just the notion of adventure. When Temperance is combined with the Chariot, this indicates that you will be put in a position that requires great responsibility. This may be related to work or a professional situation. When these two cards turn up in a spread it should be taken as a sign that you need to do some deep thinking. Wonderful things can result from this much-needed internal dialogue. Because Temperance is considered to be an overall positive card, your answer is most likely to be yes.